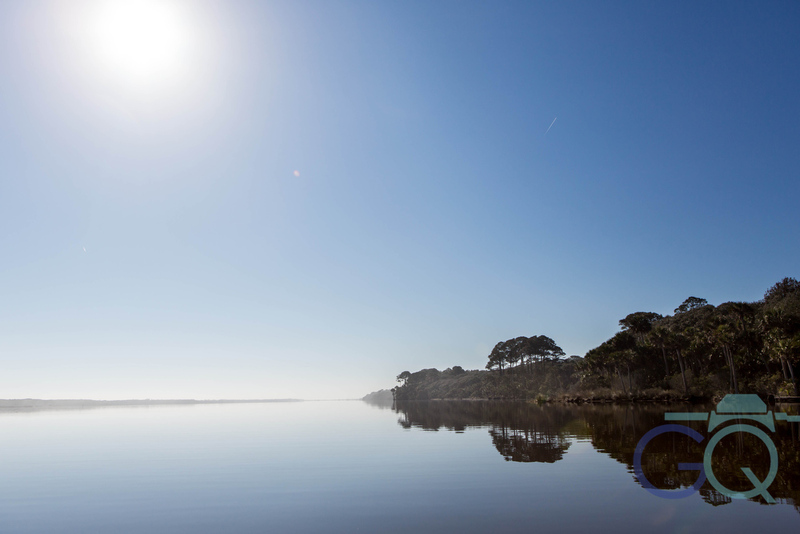 Back in January my friend, Woody Huband and myself ventured out in his motorized canoe to shoot some scenery in the Guana River and Guana Lake area between Ponte Vedra Beach and St. Augustine. We witnessed a site that I have never seen in my life and probably never will again. A Fog Bow. 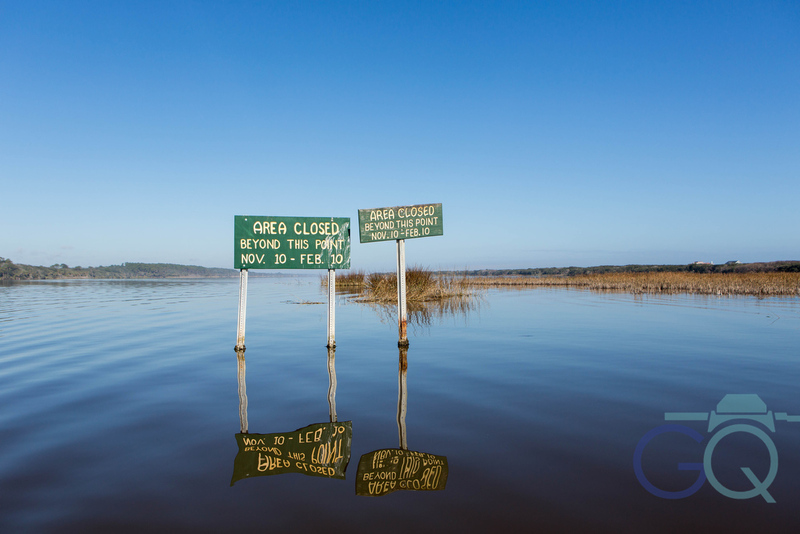 We didn’t get to launch at Woody’s regular landing because it was the first day of duck hunting season in the area so the area was restricted to casual boaters. 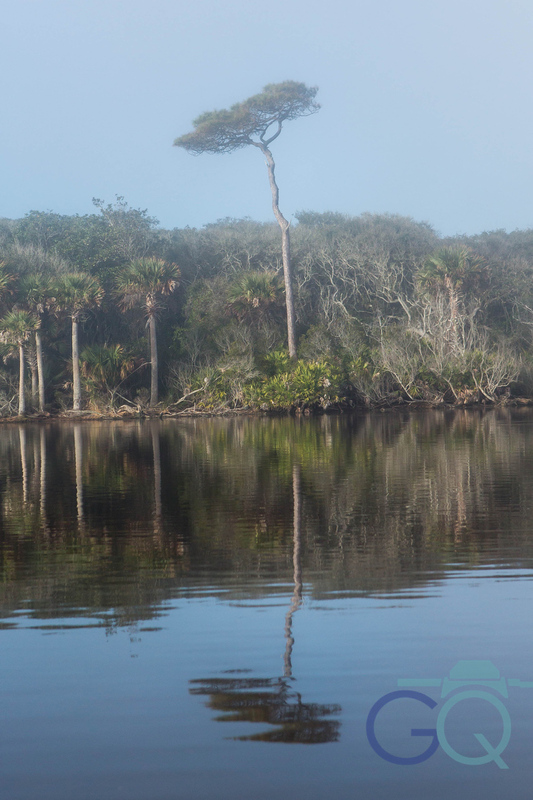 We traveled further south to the Guana Dam and launched into Guana Lake and headed back north toward the duck hunters. The above sign meant that we weren’t supposed to go past this point because of the duck hunters but it was a little foggy and the sign is on the east side of the lake and we were traveling up the west side; therefore, we never saw it until the return trip. I guess we should have known by all the shotgun shells in the water and shotguns going off all over the place. Oh, well! The weather was gorgeous with blue skies and light fog. The scenery along the bank was awesome. As we motored north we ran into light patches of fog that were centralized and gathering in one area. 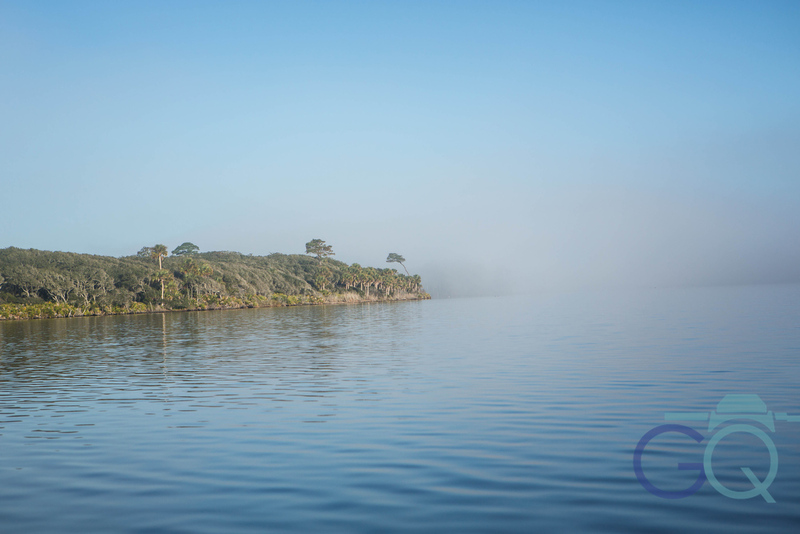 We continued in and out of the fog while snapping some photos of the beautiful scenery along the banks. Very quickly the fog started to get thicker and very white. With the sun behind us the fog had a mystic glow about it. It was a very soft white color and it actually looked like it was trying to form. You can see the fog in the below photo trying to form off of the point. The fog was drifting toward the western shore line (below) but as it got to the shore it would back off and drift back out in to open water. Woody and I were just taking all this in because it was giving us some nice photos. 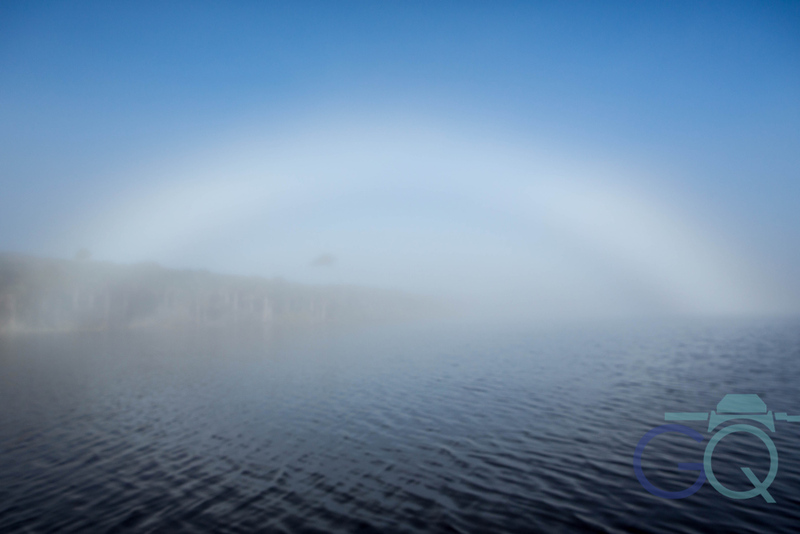 As the fog concentrated more in the open water it started forming into a rainbow like appearance. Here’s a photo where it was just starting to form. As we motored closer to the formation we noticed that the fog was actually forming into a rainbow like shape. We backed off to view it and the following photo is when the Fog Bow just suddenly formed out of nowhere. We were a little stunned as neither of us had ever seen anything like it. A perfect arch just like the big colorful rainbows. In the above photo it is still forming a little. The below photo shows it as it is fully formed and concentrated. 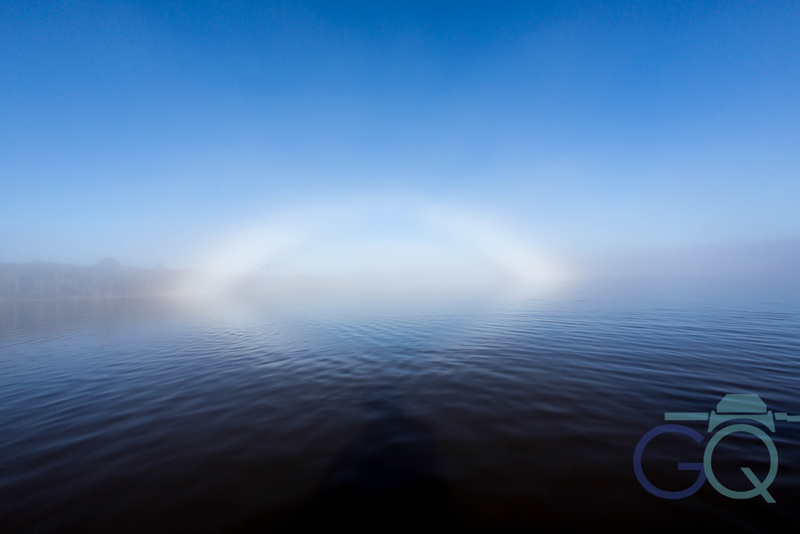 “A fog bow is a similar phenomenon to a rainbow, however, as its name suggests, it appears as a bow in fog rather than rain. 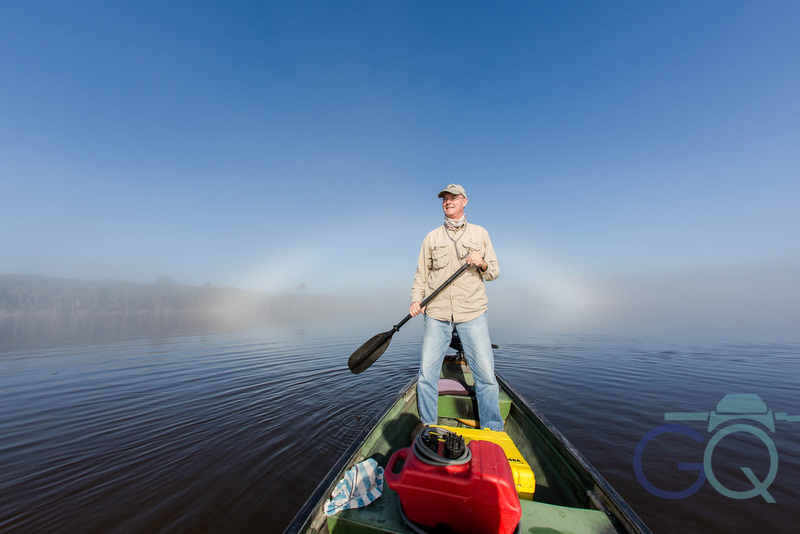 Because of the very small size of water droplets that cause fog—smaller than 0.05 millimeters (0.0020 in)—the fog bow has only very weak colors, with a red outer edge and bluish inner edge. The Fog Bow was beautiful and to add a little human element I included Woody in a few. I think Woody is going to hang this on his wall at home. 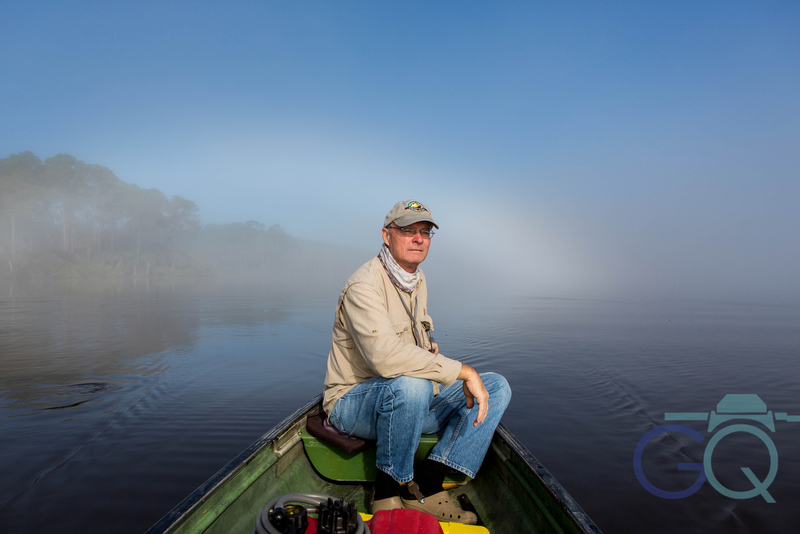 As we turned back the Fog Bow was still formed so I took a few photos of Woody framed by the phenomenon. As we traveled back to the landing I caught a pretty view of the calm waters and rising sun.